At 2:47pm July 22nd, even as firefighters were battling to contain the Martin fire just a few miles to the South, a new fire, dubbed the Citrus Fire, broke out in the Valle Vista community of Wilson Heights East of Hemet. Those that witnessed the fire in the first few minutes after it started told of just how quickly it spread. The Riverside County Sheriff's office and California Highway Patrol quickly closed off roads to all non-fire related traffic as the area quickly filled with cars and trucks filled with curious residents trying to get a better look at the fire. 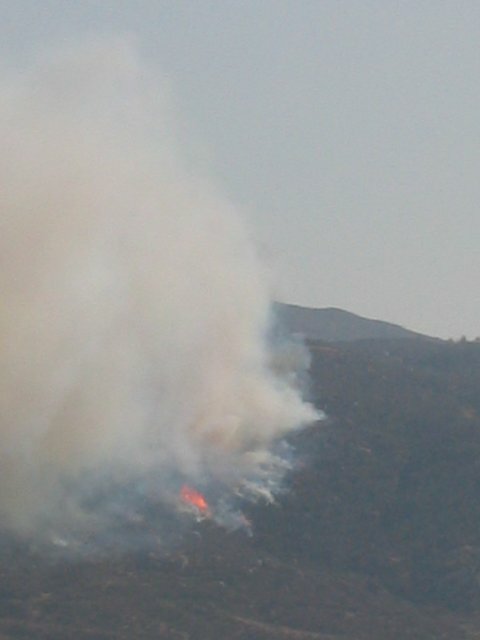 Fueled by high temperatures and moderate winds, the fire spread very quickly through the dry grass and brush that covers the nearby hills and canyons. 4 helicopters, 6 air tankers, 42 engines and 566 firefighters were assigned to the blaze. The air assault continued at an amazing rate as plane after plane flew down into the canyon, painting the hills red with Foscheck fire retardant even as the helicopters continued to drop water on all the hotspots. The aircraft continued their attack until well after sunset, doing their best to contain the fire before it got too dark to fly. By 2:00am July 23rd the fire was classified as fully contained at 765 acres. According to the California Department of Forestry and Fire Protection (CDF), one firefighter suffered burns and two suffered heat exhaustion. The Citrus fire comes on the heels of two other wildfires in less than a week south of the Hemet area. The first, the Melton fire, consumed 3,667 acres and a few structures between Sage and Hemet. Another, the Martin fire, blackened 135 acres near Sage. 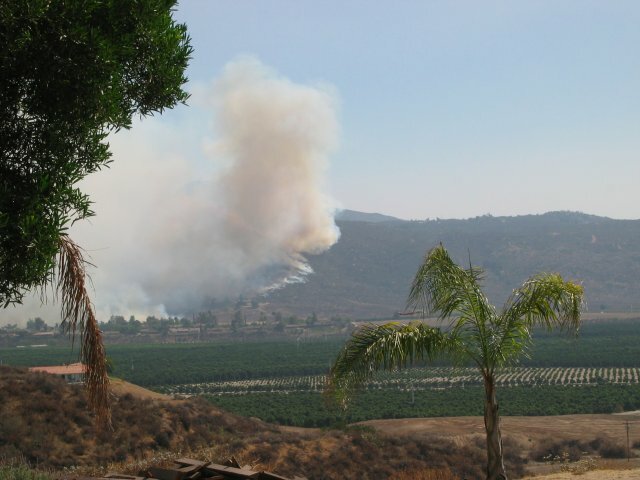 The Valley Chronicle has published a story on the Citrus fire. Pictures were contributed by Robert Leonard. See a list of past weather happenings in the Hemet area on the Features page. Browse a chronology of major Southwest Riverside County wildfires. The following photos were taken Thursday evening by Robert Leonard.